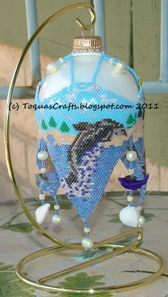 Toqua's Crafts: Dolphin Lighthouse Ornament COMPLETED! I designed this dolphin and lighthouse ornament for a customer. I've included a jumping dolphin as well as one swimming in the water, starfish and a sand castle. 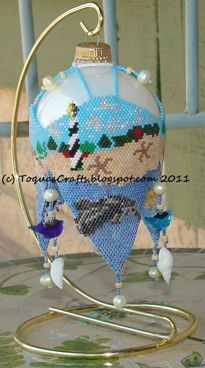 I have dolphin beads hanging in between each of the 3 sections, freshwater pearls, and sea shells. 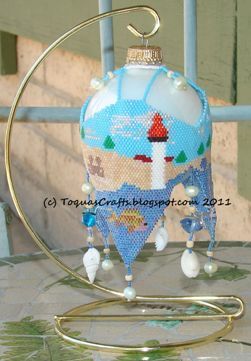 Now... onto another flamingo ornament! From my sister Marty, "This is BEAUTIFUL!!!! I love the light blue sky. I know your client is thrilled!" From my customer, "It looks amazing!" I hope your client appreciates the starfish and the dangle shells as much as I do. It's the small details that add so much to overall crafting and uniqueness of your ornaments. Each one is truly special.